This past weekend, the ChemE wanted jalapeno poppers. Someone had brought some to his office, and he couldn’t get them off his mind. Silly man. So, I agreed to make them for him. Gotta keep him happy. We ran to the grocery store and picked up a few things I needed; jalapenos and sausage. Extras: You are going to need toothpicks!! You are also going to want to bake these on a rack with a pan underneath to catch all the grease from the bacon! Preheat the oven to 375*F. Brown the sausage in a skillet over high heat. Once the sausage is no longer pink, drain the fat, then add the cream cheese. Stir until the cream cheese has melted. In the meantime, wash the jalapenos, then halve and, using a spoon, seed them. (If you want a good kick to your jalapeno popper, then leave some of the membrane and seeds. If not, scrape it all out!! And, you might want to wear gloves while doing this!! I didn’t, and didn’t have any burning, but I was also very, very careful!) Take a spoonful of the mixture and place it inside the hollowed out jalapeno. *NOW the bacon. I didn’t realize how huge the jalapenos were I used. I cut the bacon into 1/3s and the slices were too small. I had to use 3 to cover the jalapeno and mixture. My suggestion is to use a whole slice at first. If you see that you need less, then cut the rest of the bacon accordingly. * Use a toothpick to hold the bacon to the jalapeno. Repeat with the rest of the jalapenos. Bake at 375*F for 20-25 minutes. 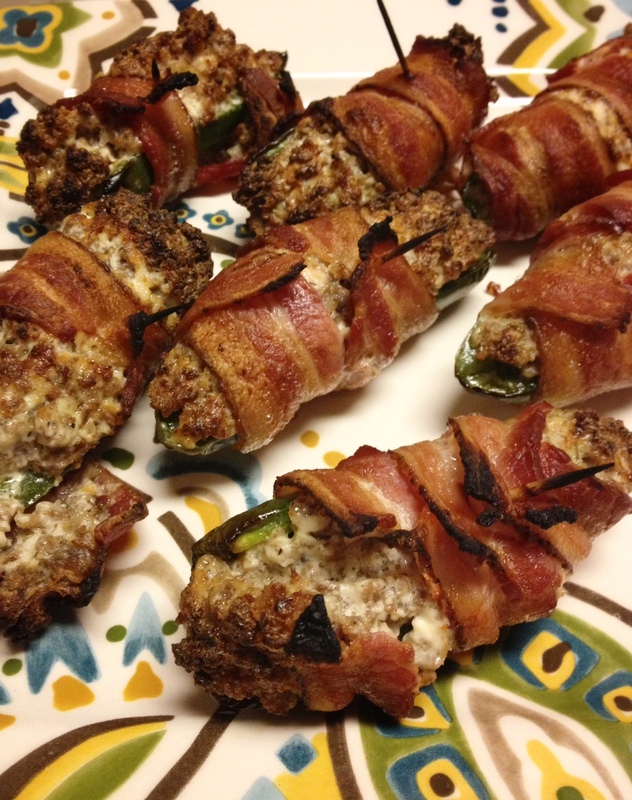 Check on the jalapeno poppers…if the bacon is starting to shrink, then turn the broiler on high and finish cooking the jalapenos. While I was typing this recipe, I thought of somethings I could do a little different! So, I may make these again this weekend, if the ChemE is not opposed, and try out my little “twists.” IF it works out, I’ll post the recipe next week!! Meanwhile, enjoy! !